Herbal hair masks are a great way to rejuvenate your hair. You all have loved Miracle Hair Mask, and the success stories that I hear are amazing. 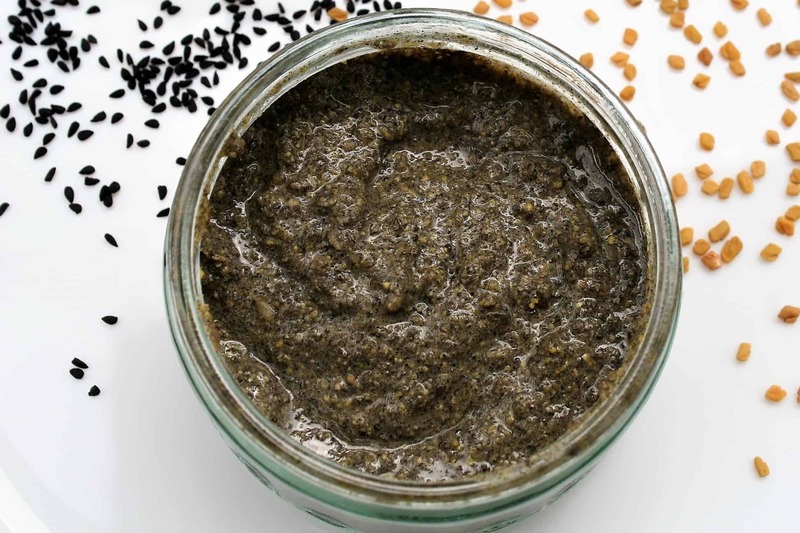 Here’s another equally powerful hair mask made with black seeds. And the hair that grows won’t be fine or fragile that falls off easily. Black seed makes your hair grow thicker and stronger. Also, it stimulates the dormant hair follicles. So you will have a denser and fuller looking hair. Although tiny, black seeds are packed with amino acids, fatty acids, antioxidants, anti-inflammatory compounds called thymoquinone, as well as minerals such as iron, zinc and copper. These nutrients make it a potent remedy to stop hair loss and thinning, and regrow thicker and healthier hair. Sounds too good to be true? There are over a thousand research articles to evaluate the health and hair benefits of black seeds. And those of you who have never heard of these miraculous seeds and here’s a little bit about them, followed by the black seed hair mask recipe. Black seeds are native to the Middle East, North Africa, Southern Europe and Indian Subcontinent. These seeds are not any ordinary seeds; their mention is in holy books and ancient medicinal texts. In Islamic literature, it is regarded as one of the greatest forms of healing medicine. And its many uses have earned Black Seeds the Arabic praise ‘Habbatul barakah’, meaning ‘The Seed of blessing’. 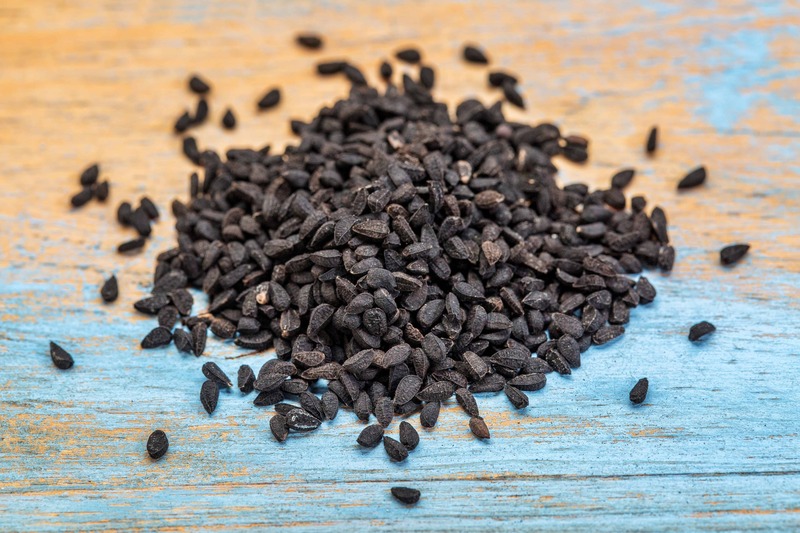 Black seeds have been used for thousands of years for eczema, allergies, asthma, bronchitis, rheumatism, to boost the immune system and for general well-being. Since these seeds are so healing, they are also very popular among researcher scientists and you will find hundreds of studies on it. From diabetes to heart conditions to hair loss, black seeds have been proven to be useful in a wide range of conditions. So while you can consume these tiny seeds to get a healthier body, you can also use them for healthier hair. These seeds work fantastic for hair growth. Black seeds is one of the most potent remedies for stopping hair loss and growing thicker hair. It can be of great help in different types of hair loss, including alopecia, telogen effluvium (TE), male pattern baldness and female pattern baldness. How do black seeds help with hair loss? Black seeds contain powerful antioxidants which strengthen the hair follicles and encourage growth. Besides, the same antioxidants also help to protect hair cells from the normal aging process that thins the hair. 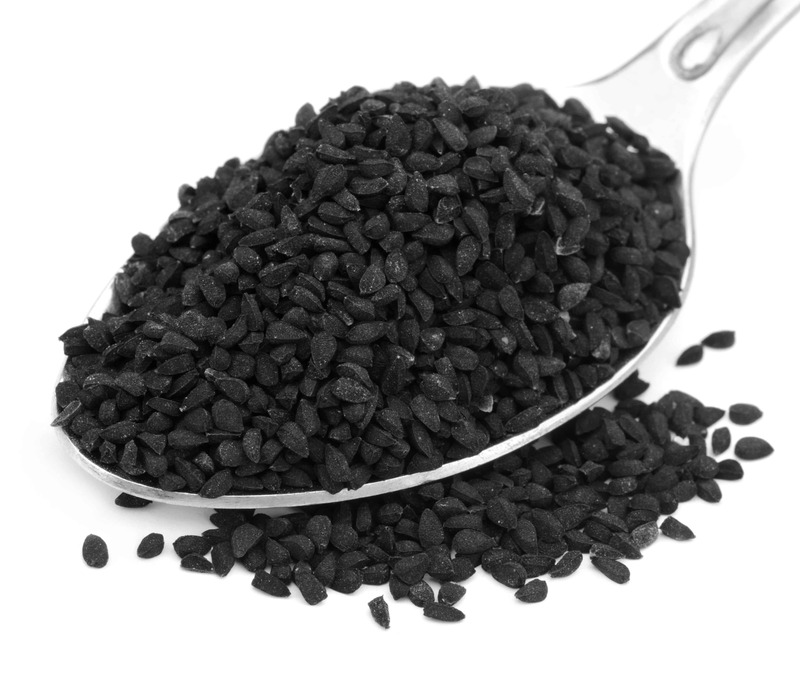 Another potent compound in black seeds is thymoquinone (TQ), an anti-inflammatory substance. TQ can help stop hair loss that is caused due to inflammation of hair follicles (e.g., alopecia and TE). With a reduction of inflammation, the normal hair growth cycle is established. It contains nigellone and other antihistamine components — which have been found to move the dormant hair follicles into an active growth phase. So you will have more hair growing on your scalp. Antihistamine also helps make your hair strands thicker (especially useful in male and female pattern baldness). Rich in B vitamins and minerals like iron, copper and zinc, black seeds provide nourishment to hair. And its fatty acids discourage scalp dryness and improve the shine and condition of hair at the same time. Of course, you will need black seeds for the mask. But to grow your hair back, you need to make the mask more potent, that’s why few more ingredients are required…..
Fenugreek helps with hair loss and makes hair strong and shiny. Honey is great for your scalp health, and it also offers moisturising and pH balancing effects. Fullers earth or (mulatni mitti) helps to draw the impurities from the scalp. Cinnamon powder has a stimulating effect on hair follicles by increasing the scalp circulation and promoting growth. Olive oil is high in antioxidant and helps to keep hair damaging free radicals away. And it also ensures shine and softness. First, grind the black seeds and fenugreek seeds to a fine powder. Place all the ingredients in a bowl; add water to make a paste. Set it aside for 1 hour (or overnight if you can). During this time the entire mixture will thicken up and become slightly slimy. If you think the mixture is too thick to apply, add more water to make the mask creamy. If your hair is on dry side, add 1/4 cup coconut milk , this will help to restore moisture as well as aid with detangling and combing,. **You can use rhassoul clay or bentonite clay in place of fullers earth. Or skip it altogether if you have dry scalp. First, grind black seeds and fenugreek seeds to a fine powder. 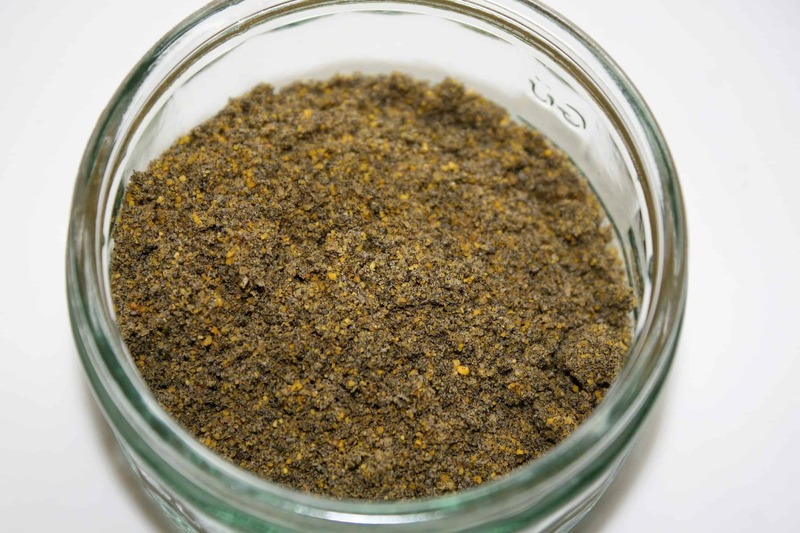 Place the black seed and fenugreek seed powder in a bowl. Next, put honey, olive oil, fullers earth and cinnamon powder. Add water or coconut milk to make a smooth paste. Set it aside for an hour or two. Start with dry or damp hair. Apply this mask to your scalp and hair. Put on your shower cap or wrap your head in a muslin cloth or a towel. You can also leave your hair uncovered as this mixture won’t drip. Leave this on for 20-30 minutes, then rinse off thoroughly. Wash with a natural shampoo and let your hair dry naturally. Repeat this mask once a week to grow thick gorgeous hair. You can easily find black seeds in any Indian shop. If that is not nearby, you can buy Black seeds online (Click Here to Buy). Buy raw honey that is unpasteurized and unfiltered and retains maximum goodness. 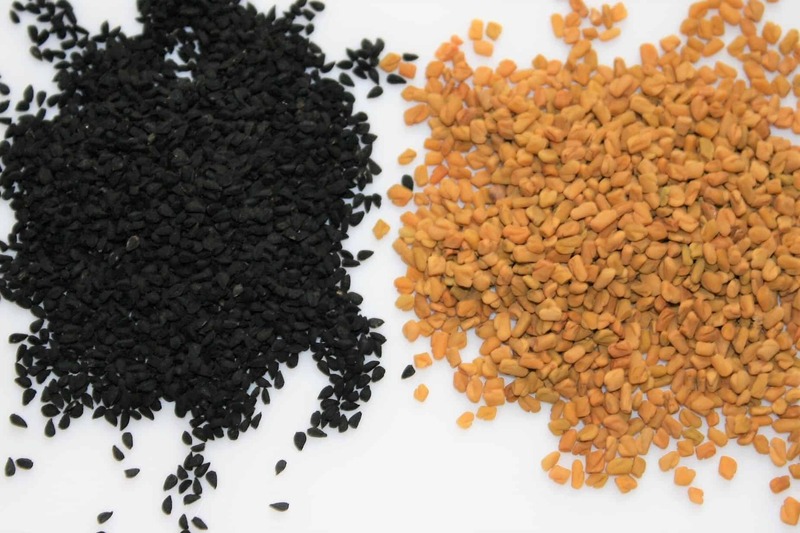 You can either buy fenugreek powder or fenugreek seeds and powder them together with black seeds. You can buy fullers earth or multani mitti online here. Nourishes and strengthen hair follicles. 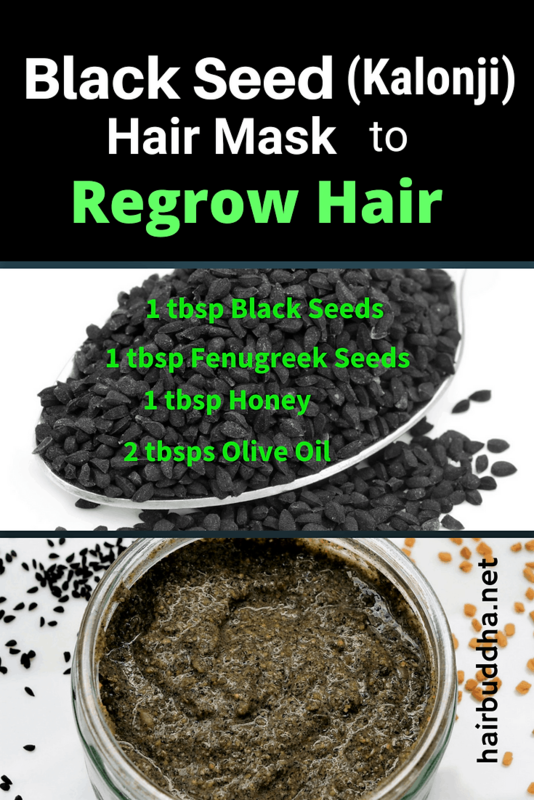 Have you tried the Black Seed Mask on your hair? Share your experiences in the comment box below! Can this pack be applied on oiled hair (I tend to keep oil overnight before washing my hair)?. I had thick dense hair since birth.I lost most of my hair thickness 3 years ago.Since then I have been struggling to restore my hair density using natural products such as using a herbal shampoo powder( amla,Reetha,shikakai ), used home made hair oils and hair packs over the past 1.5 years – onion oil,hibiscus hair oil, aloe Vera hair oil, hibiscus hair pack, egg hair pack. All the pampering gave a healthy look to my hair.The 2 ingredient- Kalonji-methi hair pack that you suggested controlled hair fall after a month of usage.I now have negligible hair fall, no dandruff or other scalp infections,my hair is growing lengthwise but I am still unable to growth thick dense hair.I also take vitamin supplements as prescribed by my doctor, I moderately exercise and eat simple home cooked food. I am already 39. please pass on a sure shot remedy to grow thick hair for women of my age. I blended the kolonji in coffee blender. We don’t have the Indian spice blender. It was not that fine. I soaked the mask for 2 hous before applying but it did not stayed in my hair it was falling on the floor any suggestion. Thanks a ton for such amazing beauty solutions.You epitomize the ‘True spirit of sharing (info) and spreading joy’. Stay blessed. Dear Asha, thanks for your kind words. Hi Minaz thank you for sharing your Kalonji seed recipes. I prefer homemade/DIY hair products since you know what’s going into them. Hi, me again. To prevent drain clogs I pour a couple of kettles of boiling water down the drain before washing off the mask and then a couple afterwards. Takes care of everything and does no damage to the plumbing system. Thanks so much for all this information and inspiration! Hello, I have used this mask several times now & I love it – so far I see a massive difference in how my hair looks and feels: thick and beautiful. That’s saying a lot because my hair was gross and scraggly & I’m 50 years old. I am sure new growth will be strong too because I also use the kalonji serum you gave. Your site has really opened my eyes to how much we can do and get results. For the person who had breakage getting the mask out, I found it very important to grind the seeds as fine as I could. I also halved the recipe (in proportion!!) because the first couple of times it was too much, quite gloppy, kept plopping on the floor, etc. I think the secret is really a superfine grind. Also, rinse in sections and do some massage. I do a first rinse, turn off the water, and then massage for quite a while with just a few drops of shampoo. One wash is almost enough, so I just use a drop of shampoo for the second time. Trust me, I’m a very lazy person so normally would never put this effort into a hair mask, but I can’t get over how effective this is. Sorry for the long message – it would just be shame for anyone to be put off just because some trial and error is needed. Thank you for all this great information. Hi KP, you did a great job of explaining! This mask is a pain to get out of the hair. I lost so much hair just untangling it all as the mask is almost impossible to get out of the hair. What am I doing wrong here? Oh that’s not very nice. Did you follow the recipe to the tee? The thing is when you try something new it’s best to sticky to the exact measurements. If your hair is on dry side, leave out the clay. You can experiment adding more olive oil or use coconut milk, which are great natural detanglers. Hope this helps. Thanks a lot for your great tips. I sure will try the mask, cause my hair is thin and sheds a lot. can we use kalonjig oil instead of olive oil? Yes you can or even coconut oil is good. Hi! For how many days can this paste be stored? Or should it be made fresh every time? Hello Aishwarya! Make it fresh! Is kalonji on its own not that great for hair mask ? Actually i have ordered cold pressed kalonji oil n m now second guessing coz many websites say mix it with other stuff. Is kalonji oil good too? Also, my main reason was for reversal of grey hair( in my case mostly caused due to careless coloring by parlour girls). Please advise. Was checking other content. Love your site! Hello Anu, Kalonji oil is very strong. You can use the oil on its own, but most people prefer to mix it with coconut oil. 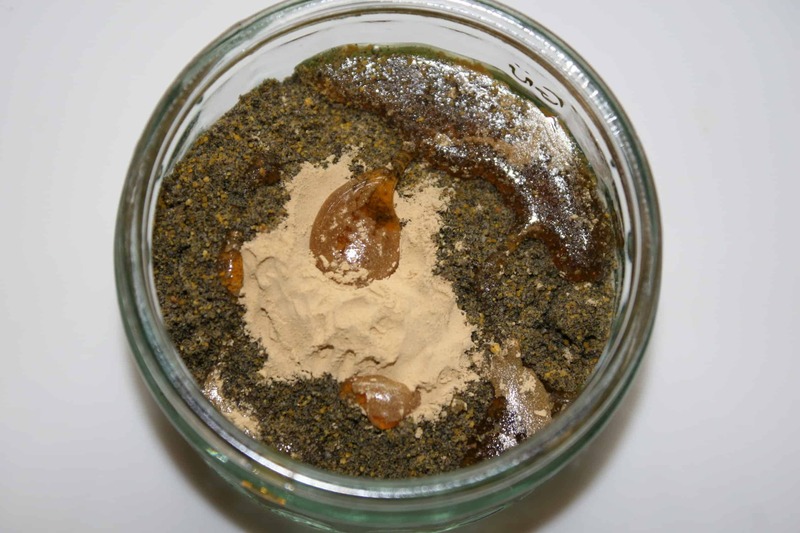 Can I simply use Soaked and ground Kalonji seed paste as a hair pack for female pattern baldness? Also, please do a write on how to prevent clogging bath tubs ( while using henna and other hair masks) for those living in USA. Hi V, Yes you can use soaked and ground kalonji seeds (I would also add fenugreek to it). I use henna mask and it doesn’t clog my bath tub. I do add white vinegar in bath tub and other sink holes monthly. Hope this helps. i’d really love to try the kalonji seeds. can i make this mask without fenugreek though? i don’t want to use ingredients that are going to affect my estrogen level. how long does this mask take to restore lost hair? U didn’t showed pic of adding olive oil to it… And can I mix mixture in iron vessel… 3rd after applying mixture on hair u suggested to wash hair with shampoo if so will the ingredients added in mixture will work if we wash immediately and provide desire results. Hey minaz…. I love u babe…. I m so grateful to u for making me hair manageable…. My hair is Pain in Head.. just bcz of u texture got better… As I was born with dry frizzy damage hair…..
Ma’am….u hv mentioned kalonji seeds. Is it also called black jeera..
Black jeera or kala jeera is a different thing. See the picture and you will know what I am talking about. Minaz, kalonji and kala Jeera are the same. Hi Brototi, we call kala jeera shahi jeera. But maybe some cultures use that term. It washes off easily. Some bits do remain, but as the hair dries they fall out as you comb. Use a conditioning hair rinse in the end. Thank you for all the info and tips you share with everyone. I am happy to find your website. I am in my 50’s and last year starts to shed lots of hair. I am hoping to try your hair mask to grow back the hair. I wonder if I can use the black seed oil instead of the seed? Would it works the same? I also thinking to put the fenugreek seed in coconut oil and warm it up to make fenugreek oil and mix with the black seed oil with the other ingredients on your hair mask receipt to massage on scalp, do you think it works the same? I am not a fan of black seeds oil, but there are many people who like it. My mother-in-law makes similar oil that you described, she adds in crushed fenugreek seeds, black seeds in coconut oil and castor oil and leaves it at sunny windowsill. She findings it very effective for hair growth. really loved this mask it’s wonderful for my hair. I’m using it twice a week with rosemary and thyme hair wash.
How do you make rosemary & thyme hair wash? Hi Minaz, I am in Sydney, Australia. My daughter is going daycare all 5 days. Morning 8.30 to 5.30 .Center provides food. We are pure vegetarian. I tried to give her boiled egg but she refused to eat it. She is just 4.5 year. I have notice her hair color is getting change from black to brown. And she has 3-4 white hair also.very dry hair and curly. She has not much but bit hair fall problem also. Can you suggest any hair pack or mask to improve hair color, texture and hair fall for her ? Any diet I should follow. I am worried because she is just 4.5 . Waiting for your reply. Hi Avani, you can use plain coconut oil to massage her hair and that should be enough. She is too young for a hair mask. I would also suggest you visit a doctor and get her checked for any deficiencies like iron, b12, vitamin D.
Even though vegetarian, if you eat a diverse diet – grains, legumes, seeds, nuts, dairy, fruits, veggies, it takes care of all the body requirements. Can this mask be used on blonde hair without changing the color? Hi Maria, it won’t dye your hair. Let me know how it works for you. Hi Meera, if your hair/scalp is on dry side feel free to skip the clay. The beauty of homemade masks is that you can make it according to your hair’s needs.